Clear the Clutter & Collect the Ca$h! Register as a consignor with us by logging in and selecting the Edina sale. Then purchase your consignor ticket and schedule your drop off time HERE. This ensures a smooth drop off! Check out our wealth of information about prepping your items below! If there is a question that you have and you can't find the answer, please do not hesitate to contact Jeni! Once you have prepped and tagged your items, come to Southdale Center Door 21 (upper parking level by Dave & Busters) at your scheduled time. After inspection, you place your items on the sales floor. You will receive your consignor check within 2 weeks! This is our Spring/Summer Sale, so be sure to keep that in mind when you are prepping! JBF Edina Consignors earn an average of $300 at each sale! • Consignors who are able to help during (or before) the sale for at least 4 hours earn 70% on their item sales. • Consignors who help with 3 or more shifts will have their consignor fee returned to them in their consigner check. Too busy to tag and drop off, but still want to sell? See information on our new Valet Program! Join other smart & savvy helpers who cover shifts in exchange for early shopping privileges and a higher percentage on their sold items. We LOVE our JBF Team! 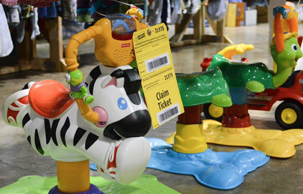 Over 100 helpers make each sale event the perfect place for families to find great deals on items they need! Please note: all Team Members must consign at least 15 items. Consignors who are unable to help at the sale will earn 60% and can shop at our presale at 5pm. 1. Bring your items tagged, prepped, and sorted by type & size. 2. Bring your signed Consignor Agreement, Car Seat Waiver, and Crib Waiver (if applicable). 3. A JBF Team Member will check you into the system. After inspection, you will place all items where they belong on the sales floor. Please plan to allow 30-90 minutes for this process depending on how many items you are selling. Find more items to consign? You can bring them to this mid-sale drop off and still make the sale! Clothing & shoes are NOT accepted during the Mid-Sale Drop off. If you would like your unsold items returned to you, please pick up during this time. Our awesome Team Members will have your items sorted by consignor number and ready for pick up. All items that have not been picked up by 6pm are automatically donated to our charity partners at 6:01pm. Your will receive your check within 2 weeks! Yay! We sell children's clothing Newborn through size 20 (limit 25 girl's junior size items, name brand preferred) as well as maternity sizes (limit 25 maternity clothing items per consignor). Our sales are seasonal so Only Spring and Summer clothing will be accepted at our Spring sale and Only fall & winter clothing will be accepted at our Fall Sale. Be picky. Look at your clothing items as if you were going to purchase them. No stained or damaged items will be accepted. Any items that look like "mom's" clothes will be rejected at inspection. Please freshly clean your clothing items. Replace missing buttons, sew loose hems and seams, and clip loose threads. Please button all buttons, snap all snaps, zip all zippers before you arrive at drop off. This will ensure that there are no defects in the clothing. The newer the item looks (and the better it smells), the better it will sell. Package & Hang: Hangers - Please hang clothes so the hanger hook points to the left (like a question mark). Hang size 0-6 clothing on child-size hangers and sizes 7-20 and maternity clothing on adult-size hangers. Clothing that falls off the hanger onto the floor does not sell well so we prefer clothing to be safety pinned to the hanger. Old Navy and many outlet stores are great places to get free hangers (they throw away hangers daily!) and WalMart & Target sell child-size plastic tube hangers at a great price. Clothing Sets - Sets tend to sell better (under size 6) so match things up if you can. All garments should be hung with the hanger hook pointing left (hanger should resemble a question mark when looking at the front of item). Safety pin or use a tagging gun to attach clothing sets securely so both pieces can be viewed without separating them. Pants/Shorts - Pant-clip hangers are great but if you use a standard hanger, simply use your safety pins to attach pants to the TOP part of the hanger so the garment will not slide. Onesies, socks, tights, hats and infant mittens need to be in a clear zip-lock bag (you may group multiple items in one bag). Please be sure to label your tag well so that customers know if the items are short-sleeve onesies or long-sleeve onesies. Exersaucers, swings, high chairs, changing tables, cribs (Manufactured AFTER June 28, 2011; please bring Crib Waiver for all cribs and a Car Seat Waiver for all car seats. 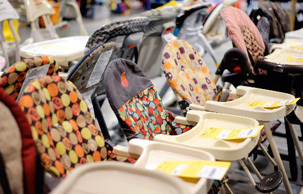 Strollers, bath seats, baby walkers, car seats & car seat accessories must be checked for safety recalls, must have all parts, and be in good condition. Children's furniture - beds (toddler, twin), desks, side tables, dressers, etc. See Safety Link to check recalls. Package: If item has multiple pieces use packaging tape, zip-ties, or string to keep items attached together. If wooden furniture has loose parts, use a clear zip-lock bag or plastic wrap to secure item. All furniture and equipment must be assembled during the sale. Batteries must be included, if applicable. Please bring a Car Seat Checklist for all car seats, booster seats, and car seat base or infant carrier. Package: Fasten shoes together with zip ties. For infant shoes or small shoes without laces, you may put the shoes in a clear zip-lock bag. We prefer no shoe boxes (shoes in boxes do not sell well). Diaper bags, infant carriers, backpacks, and purses are great consignment items. Please inspect all items carefully to make sure items have not been recalled (link), stained, damaged or are missing pieces. Package: Please zip-tie items to an adult-size hanger. If you would like to zip tie item to clothing rack for extra security please ask a team member for a zip tie at check in or bring your own. Package: Use clear, self-seal bags or clear cling wrap/saran wrap (NO Glad press and seal as this can damage items) to hold multiple items together; Tie sets of books together with ribbon/string. Be sure that parts/games to video game systems (such as Vtech) cannot be separated or switched out at the sale. Price: Prices can range from $.50 to $50 in this category, depending on the item. Books priced at $1-2 each sell well. Price to sell especially for books & DVDs as there are always lots to choose from at the sale. Tag: When tagging books, please attach your tag to the book with clear scotch tape or painters tape that can be removed without damaging the item. Tape tag to the back of the book covering the books UPC/barcode (to make scanning your item easier). Please do not use masking or double sided tape. Hole-punch JBF tag and tie to sets. Nursing covers & pillows, feeding items, monitors, safety items, diapering & toileting items, rattles, and more. Please check for safety recalls (link) on all items that you consign. Package: If item has multiple pieces use packaging tape, tagging gun, safety pins or clear self bag (sealed shut with clear packing tape) to keep items attached together and clearly visible to shoppers. Batteries must be included, if applicable. Tag: Attach JBF tag directly to item or clear bag with clear packaging tape or hole-punch JBF tag and tie it to item. Are You a Super Seller? We love our "Super Sellers!" Super Seller are those folks who bring 300 or more items to our events. We ask that each of these sellers participate in our sorting shift on Sunday. If you are unable to help for this shift, but you would still like to participate, you will be assessed a $20 sorting fee. We will be using DROP ZONES again this season for Consignor Drop-off. When you get to Southdale come inside, check in, and have 1 item or your consignor number with you to make check in faster. After check-in bring your items inside. We will have rolling racks for you to use. There will be DROP ZONES for the different categories of items (books, toys, baby equipment, ect). Put your items in the appropriate zone and someone from our team will inspect & put your items out for you. You hang your clothing on the rack by gender & size. After your items are in the appropriate zones, check out and get your presale pass. That's it! You did it!